It feels very strange to think back to being in the closet - it's getting on for 30 years since I first pushed the closet door open and was able to begin to form an identity for myself. I knew I felt attracted to men before I could articulate those feelings. I’d watch television shows and films and feel confused about why I was interested in some of the male characters more than others and why I felt 'funny' looking at them. I first told people I was gay in 1984 (I was 12) during a torturous and wet cross-country run at school one afternoon. Being so young no one believed that I was actually gay, even though I knew I was. My class mates simply grew up with the idea and I never, ever, faced shock or drama from any of my peers. This was a very visible time to be gay - Frankie Goes To Hollywood, Marc Almond and more than anybody else, Bronski Beat were bringing an unapologetic gay experience into people’s living rooms (via Top of the Pops etc) like never before. Pop music has always been my cultural touch-stone and these records meant the world to me, and in some cases literally saved my life. Prior to that I think the only representations of anything approaching gayness that people saw. on British TV anyway, were John Inman in 'Are You Being Served' and Larry Grayson on 'The Generation Game'. But I never equated such displays of camp with my own identity or feelings. When I was 14 I felt I needed to speak to someone who wasn't a class mate so one evening when my parents were out I called the Gay Switchboard. When someone answered I told them I was 16 as I didn’t think they’d talk to me if I told them how young I was. "The guy I spoke to, Mike, absolutely changed my life. I was on the phone to him for over two hours and I felt euphoric afterwards." I bought my first issue of Gay Times after walking up and down outside the newsagents for about thirty minutes with a palpating heart due to nerves, before plucking up the courage to dive in and pay for it as quickly as I could and then get out. The magazine was a window in to a new exciting world (it seemed to me at the time), yet still tantalisingly out of reach to me because of my age. I don’t recall any big coming out drama; I always assumed it was pretty obvious I was gay. My parents and grandparents were generally supportive though I think worried, being as we were in the middle of a huge anti-gay political backlash, fuelled by paranoia about AIDS and homophobic legislation. I didn’t have any negative reactions and always stood up for myself if gay taunts ever emerged at school. I later found out I was often discussed among the teachers at school with a grudging respect, and also heard from a class mate who did come out after he’d left school that I’d been quite a role model. I wish they’d been able to tell me so at the time. A great deal of the torment I felt was self-inflicted, worrying about how people would react when in truth the vast majority didn’t care one way or another and the rest were incredibly supportive. What was such a big deal to me really wasn’t for the people I knew because they loved me anyway. When I went to University I made a beeline for the lesbian and gay society at the Freshers Fair. I quickly made friends with some of the younger people (there were a lot of mature students there) and we started going to youth groups around London, although the lack of other female members meant I eventually ended up going on my own. But finally I was in touch with people like me, with people who had suffered far worse things than I had done yet they were proud about who they were. "These people, some of which had been made homeless just for being lesbian or gay, were my first real life peers and role models." One of the groups I got involved with was called Stepping Out and they used to meet at the London Lesbian and Gay Centre in Farringdon, sadly long since gone. I eventually joined their committee and helped to organise events. We met on the top floor of the centre and we were next to the offices of the direct action group OutRage! There was nothing apologetic about OutRage! They were in your face and I found their stunts and actions very exciting and novel. Being a typical student of the 1990s I went on many demos, the age of consent for gay people then was still 21 and OutRage! led by Peter Tatchell were among the groups lobbying and protesting to get that changed and to acheive equality. One demo I went on with Peter ended up with a great group photo, including me, that was on the front page of the Pink Paper. Peter inspired me to try and make a difference. That positive change doesn’t just happen – you have to get up, get involved and MAKE it happen. He also taught me to be unapologetic about who I was and about whom I wanted to love. More than anything he showed me that LGBT people should not accept compromise like the half-baked reduction in the age of consent from 21 to 18 - we should accept nothing more than full equality. Once I left university I had to move back to my parents’ and I lost touch a bit with my London gay world. I got involved with our local Gay Switchboard, there was no youth group in Essex, so I decided I had to set one up myself. With Switchboard’s help we soon had a weekly group up and running and occasionally someone who I’d been at school at would come along. Once he told me how he’d always looked up to me at school because I wouldn’t take any crap about being gay and I was never ashamed, never hid myself I was always open and honest about who I was. 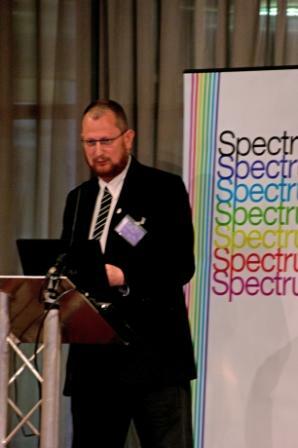 I am now paid for being gay - I chair a support network for LGBT staff in the civil service and whereas in my teenage years I was desperate for any gay friends I now think I know far more LGBT people than straight. The American writer and actor Harvey Fierstein once said, “If everyone came out homophobia would vanish overnight”. Whilst that may be rather simplistic and utopian I do think there is an element of truth there. Whilst I’d never out anyone against their will I do think that the more people that feel comfortable to come out the better. I’d like to say come out, wherever you are, the world isn’t perfect for LGBT people by any means but every day we are getting closer and closer to full equality and inclusion.